Cantilever K-Truss Bridge Imploded on 9 March; Running Slough Bridge also to Disappear. Because of its narrowness, combined with the roadway being in a flood plain and problems with river navigation, officials from Iowa and Illinois agreed to build a new span in 2013 while trying to give away the bridge to a party wishing to relocate it (see article here) Unfortunately there were no takers and therefore, the bridge was condemned, however some pieces will be reused for an exhibit in both ends, serving as a reminder of the bridge’s time as a toll bridge, serving the Short Route, connecting Cedar Rapids with Chicago. The Pratt through truss approach spans to the main span will be dismantled and the demolition of the bridge will be completed by May. 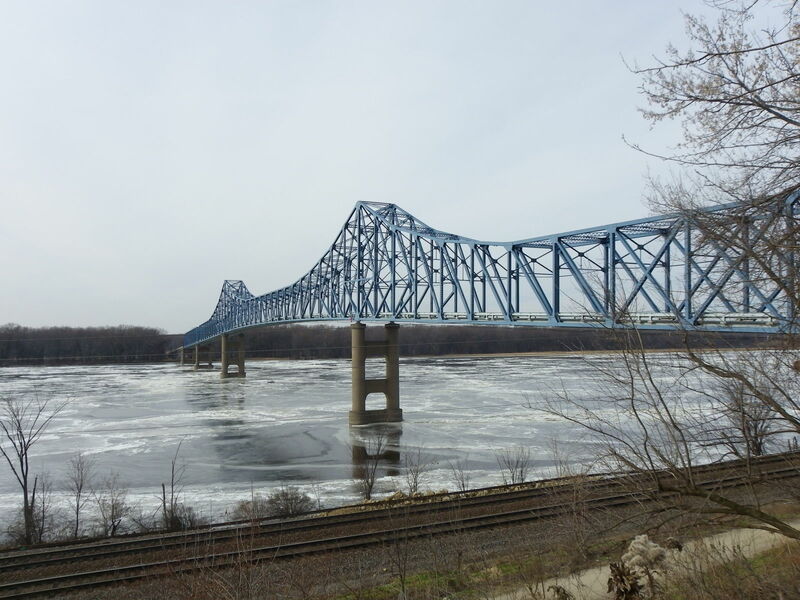 At the same time, another accessory connecting Savanna and Sabula, the Running Slough Bridge (as pictured below) is being removed even as this article is released. The Pratt through truss span with West Virginia portals was built at the same as the Savanna-Sabula span and was the entry point to Sabula. The bridge was originally scheduled to be replaced this summer. However the partial collapse of one of the approach spans has prompted Iowa DOT to move the timeline forward and remove the bridge right away. At present, the new span is to be built and opened by the end of May. Whether this date is realistic depends on the weather conditions, especially because of the harsh winter the region has had, combined with possible flooding caused by the spring thaw. I’ve been a bridgehunter since I was five years old, having photographed and written about tens of thousands of bridges in 14 countries (including the US) and 14 states in the US (including my home state of Minnesota). In Germany, I’ve covered all but three of the 16 Bundesländer. This includes Saxony, the region I’ve been touring since 2016. I’ve been running the Chronicles since 2010 and have worked with groups on how to not only restore historic bridges but also how to make them attractive for tourists. This includes my involvement with historic bridge conventions as coordinator and speaker and my use of social media to garnish the attention of interested readers and other history enthusiasts. I’m also a teacher of English, which I’ve been doing since 2001, and since August 2017, I’ve been based full-time at the Saxony Police Academy in Schneeberg, located only three kilometers from the Bockau Bridge. It was also the same time period as my time in Saxony that I’ve done tours in the region, be it in cities like Dresden, Rochlitz, Leipzig, Glauchau, Zwickau, Aue/Schlema and Chemnitz, just to name a few, or along rivers like the Mulde and Elbe. And it was these bridgehunting tours that got the attention of the regional newspapers, namely the Free Press in Chemnitz, whose news reporters at the regional offices led me to this group saving this particular bridge. And as for the bridge itself, it has more history than many locals know about. It was built in 1872 and is made of natural stone from the Ore Mountains. It took approximately a full year with lots of manpower to construct a multi-span stone arch bridge that connected Bockau with Albernnau and Zschorlau on the opposite side. At approximately 200 meters in length, the bridge is the longest in the western Ore Mountains and second longest along the Zwickau Mulde River. A local restaurant with the name Rechenhaus was the site of the dam and lock area and headwaters plant, which were built between 1556 and 1559. The first bridge- a wooden covered span- was built in 1559 spanning the river and canal complex. The flow of the water was ideal for transporting materials downstream, and workers constructed several canals in the mountain region less than 90 years later. Even the headwaters plant was once a mill before it eventually became the barracks for the 11th Panzer Division of the German Army during World War II, where they used the bridge to march into Czechoslovakia and Poland. In an attempt to slow down the progress of advancing soldiers from the east, the 11th Panzer Division was ordered to detonate the bridge in April 1945. This is the same tank division of German army that had fought (and lost) at Stalingrad, Kursk and the Battle of the Bulge before retreating towards Germany. Yet a brave unknown soldier did the unthinkable and relocated the bombs to a temporary bridge in Fährbrücke (south of Zwickau) before blowing that bridge up. This allowed for the Soviets and Americans to easily cross the bridge with their tanks with ease while setting the people free in the process. The 11th Panzer surrendered in Passau on 2 May, 1945, six days before Germany capitulated. The same bridge was used again 23 years later, as soliders from the Warsaw Pact armies, consisiting of mainly Russians and East Germans crossed this bridge enroute to Prague to quash the Spring Movement. By that time, the headwaters house, which had been the barracks, was converted into the Rechenhaus Restaurant, which still serves customers today. Talking about history, politics and the future of the bridge. The bridge was renovated in 1988 when concrete decking was added and the arches were reinforced with steel bracing. The bridge has been listed by the German Preservation Commission because of its cultural significance. Yet despite all the history that is involved with this bridge, the historical monument has become a stranger to people in the region, having somewhat lost its face in the eyes of the locals. The mayors of Bockau and Zschorlau would like to see the bridge gone once its replacement opens. The same with the state of Saxony and the German government, both are championing a 6.4 million Euro project to replace the old bridge. And despite the petition going around for saving the bridge, a handful of politicians are interested in keeping the bridge for pedestrian use after the new structure is built- most of them with little affiliation with the region with the exception of the Green party. Our first meeting at the Rechenhaus Restaurant, the historic building which once had the barracks but was originally the headwaters mill and dam complex. The restaurant has a very Erzgebirge taste to it, with a collection of incense men and wood-carved chandeliers. Opposite the entrance to the restaurant is a mahoghany-framed painting of the dam and mill as it was in the 16th century. Some in the committee would like to see it again as a way to slow the flow of the Zwickau Mulde. The river had flooded towns downstream on six different occasions since the bridge was built, with the worst of them having occurred in 1954, 2002 and 2013. Given its proximity to the bridge, many would like to see the restaurant as is. Yet its location during the construction period has become a painful inconvenience. Talking to the restaurant owner, he was deeply disturbed by the construction and stated that since the project started, he had lost up to 60% of his customers. Whether he can compensate once the new span opens remains unclear. We were nine people minus the restaurant owner, each one with a new set of ideas on how to keep and possibly fix the bridge so that it can be used again. Yet as seen with the American historic bridges, money needs to be there in order for it to happen. Political connections needs to be there in order for it to happen. The same with the use of media and lastly support from the public. As with all historic bridges, the public is the first line of offence in pursuing the preservation of historic bridges. Whether it is with petitions, technical know-how or even planning events, they always have the ideas first before our elected officials. After that, we get the attention out there via social media. Through that and the events, the politicians come in with bills to approve measure to restore the bridge. Then the money comes in to pay for the costs. For our bridge in Bockau, we’re already at step one, which is public interest. A petition with 1700 signatures was sent to Dresden to the state parliament. Another one is in the works which includes an English version for people to sign and establishing a website. That will be my job for right now- an important one! Speaking from experience with the Green Bridge in Des Moines, gathering interest in social networking will make waves and influence the thinking of the higher-ups of politics and business. Once that is established and we have the English version to submit to Dresden, the next plan is to meet with officials in Dresden to discuss the situation and ways to make the historic pedestrian crossing a reality. A big plus is the fact that the bridge and the mill area are historic lanbdmarks which make it impossible to tear down unless ordered by the federal government. How that works will come in a later article. Then with the connections and planning will be the events. This is where the tough part comes in. How to make this bridge attractive to tourists of all age? We’ve looked at drawing contests, concerts and the like. But what else could be do there? And how can we raise money for the project? This is independent on any funding available for rehabilitating the bridge, which is scarce at the moment, but the search continues. It’s a battle that one can lose but it’s better to die trying than to sit and do nothing. The mentality has increased in the US over the past decade, yet Germany does have a lot of pride in its history and culture, too much of it to just sit and do nothing. And with that, I must set to work. I have my expertise to use and share, while others are garnering some more support from locals and interested people in the project. Therefore, what are we waiting for? Get to work! The Preservation Committee including the restaurant owner. Bridge built in the 1600s to be replaced on a new alignment. Petition to reuse the bridge for pedestrian use still in the running. AUE (SAXONY)/ DRESDEN/ BERLIN- While we read about historic bridges being demolished we mostly find metal truss bridges, between the ages of 70 and 130 years, that are coming down, despite having potential of being reused. We almost never see a stone arch bridge that meets the wrecking ball, regardless of age. That is unless you look at and read about this bridge, the Bockau Arch Bridge, spanning the Zwickauer Mulde River at the village of Bockau, six kilometers southwest of Aue and exactly the same south of Schneeberg in the Ore Mountains (Erzgebirge). Built in the 1600s, the bridge is located near the historic Rechenhaus (Headworks House), dam and waterway, which had been built between 1556 and 1559, providing drinking water to the villages along the river. The crossing was essential for miners needing to use the bridge as they cross between Zschorlau and Schneeberg on the northern side and Bockau on the opposite side of the river. The five-span stone arch bridge, made using sandstone, was rehabilitated in the 19th century and survived a scare in April 1945, when Nazis tried to implode the structure in a failed attempt to stop the advancement of Russian troops from the east and Americans from the south and east. American troops from the 11th tank division occupied the bridge before the Nazis could demolish the structure. Despite this, plus two major floods that caused damage to the structure (the last resulted in adding steel bracings to the arches), the bridge remains in decent shape- at least from my observations- although potential rehabilitation is needed to prolong its life much longer. Despite its historic status, the 400+ year old structure is coming down. Crews are cutting down trees in a plan to build a new structure to better accomodate traffic from Schneeberg and Zschorlau while at the same time, realign German highway 283 to eliminate the sharp curves the historic bridge presents to the highway. According to the Saxony Ministry of Transportation and Infrastructure, the bridge will be a straight crossing, having a modern style with skewed approaches. The highway will be expanded into an expressway, merging traffic with that from Bockau. This includes bike and pedestrian paths. In addition, new retaining walls at the new bridge will be needed and the rock escarpment that flows down through Bockau into the Mulde will be redone. In the last phase of the project, which will be completed by November 2019, the historic bridge will be removed. This will happen towards the end of next year, unless waves are made by locals and politicians to keep the bridge in tact to be reused for pedestrian purposes. A petition was created in April of this year, calling for the bridge to be left as is, even after the new bridge is built because it retains its historic character and is protected by the German Preservation Laws (Denkmalschutz Gesetz). In addition, three rare species reside at and near the bridge, including the fire salamander, different species of bats and the water ouzer (dipper). Calls for saving the historic bridge is gaining momentum, as even members of the German Green Party are calling for the bridge to be saved for the aforementioned reasons. Still, resisitance has been ignored for the State of Saxony has rejected plans for a two-bridge solution, and the Federal Government, which is footing the 6.4 million Euro project, expects the historic bridge to be demolished by November 2018. The fight is still on but time and resources are running out, especially with every tree that is being cut down for the project, as the author observed during his visit on the 28th of August. In this picture, you can see how the new alignment will look like, with Highway 283 in the background. Already the bridge is closed to traffic as of the 28th of August, as seen from my visit. The Zwickauer Mulde Bike Trail (which runs under the historic bridge) is also fenced off, with a detour following the current highway and street going to Schindlerswerk on the southern side of the river. The 1.5 kilometer detour is expected to remain in place until November 2018, when the bridge is removed. Highway 283 will be detoured from Aue through Zschorlau and Albernau beginning in September and lasting until the completion of the project in November 2019. Local traffic between Bockau and Aue will remain open with some restrictions. Whether this plan will still take hold, depends on the progress of the petition for the preservation of the old bridge and whether authorities in Dresden and Berlin will concede and allow the locals to keep their bridge. Should that not be the case, this project may have some repurcussions with other projects in the pipeline, including the plan to replace the Chemnitz Viaduct to better accomodate the German Railways’ (the Bahn) InterCity trains. That project, which has been stalled due to stark opposition from locals, the state historic preservation office and other experts in bridge preservation, is also being backed by Berlin as the Bahn is partially owned by the government. Historic Bockau Bridge is now closed. Chances of saving the structure, let alone photograph it are getting slimmer by the day. If you want to sign the petition to save the bridge, click onto the link and include your name, address and reasons for saving it. Never say never if you want your historic bridge kept in place once the project is finished. The Chronicles will keep you posted on the latest. 52-year old bridge to be replaced due to structural wear and tear. Documentary following events. LEVERKUSEN, GERMANY- There is a growing theory regarding bridge building which states: build one that lasts 100 years and requires no maintenance. This demand is especially high in the United States and therefore, the focus of bridge construction has come down to cable-stayed suspension bridges, suspension bridges, girders and slabs. Sadly though, this theory always gets rebuked when one needs to look at the increasing number and size of vehicules crossing them, plus the need to maintain them on a yearly basis to ensure that this utopian goal is realized. With the Motorway Crossing in Leverkusen (known as the A1 Rheinbrücke), the bridge is overtaxed with vehicles and despite extensive maintenance, the state of North-Rhine Westphania, together with the cities of Leverkusen and Cologne are now working on a replacement bridge. Built in 1965, the bridge features a cable-stayed suspension design, using one set of towers and cables in the middle of the roadway with cables anchored in two different lines supporting the median, which supports a steel deck girder roadway that supports the Motorway A1. The bridge was built by Hellmut Homberg, who was the Othmar H. Ammann of bridge building, having built several crossings in the Rhine-Ruhr River regions, including structures in Duisburg, Bonn, Cologne and Emmerich. The longest suspension bridge in Germany was built in Emmerich and is credited to Homberg. The A1 Rheinbrücke provides direct service between Saarbrücken to the south and places to the north, which includes Münster, Bremen, Hamburg, Lübeck and two-lane to Fehmarn. The crossing is one of the oldest of its modern type, even though records showed that a tunnel and a basket-weaved tied arch bridge were also on the table (note: The latter can be seen in the Fehmarn Bridge, as reference). The bridge has a total length of 1061 meters; the main span has a length of 280 meters. The width of 31.7 meters includes the expansion of its original four lanes to six in the mid 1990s. Originally slated for replacement in 2025, construction of the bridge is currently in the preliminary stages with plans to have a new structure in place by 2020. The reason: Because of the increase of traffic, both on the bridge as well as underneath with ships travelling along the Rhine, combined with weather extremities, structural weaknesses, especially in the steel, has become so great that rehabilitating the bridge has no longer become an option. Patchwork and weight limits have been conducted on several occasions, but only for the purpose of prolonging the bridge’s life until its new structure is open to traffic and the old one is removed. Do you agree with this design preference? If not, how would you go about with this project if you are the planner, engineer and city official? The Autobahn 1 is one of the oldest motorways in Europe, and the third longest motorway in Germany behind A3 and A7. The Weimar Republic proposed building a highway without intersections and traffic lights during the 1920s, yet was realized through massive construction efforts during the time of the Third Reich. The A1 was presented in 1939 but serving the Rhine-Ruhr region, as well as in segments to the north. The rest of the autobahn was completed in the 1960s and later expanded in the 1990s and 2000s. The last segment at Fehmarn is being fought by locals because of the negative environmental impact on the island through a new crossing between the island and Schleswig-Holstein as well as between the island and Denmark. The battle is ongoing and one can read more here.….. The Rheinbrücke in Leverkusen is one of several bridges of its kind that have been targeted for deficiencies. Two other cable-stayed bridges in Duisburg and Cologne (Severin Bridge), plus the Köhlbrand Bridge in Hamburg are having the same structural issues because of too much traffic and are facing the same fate as the crossing in Leverkusen. A bridge tour of the region along the Rhine can be found here. HOOKSETT, NEW HAMPSHIRE- After the Boscawen, Milford and Sewall Falls Bridges, another bridge is being targeted by the State of New Hampshire. The Lilac Bridge, spanning the Merrimack River in the town of Hooksett, is one of a handful of examples of truss bridges built by local bridge builder John William Storrs, with this one having been built in 1909 using bridge parts manufactured by the American Bridge Company. The bridge has a total length of 490 feet, consisting of 165-foot long riveted Pratt through truss spans, each featuring Town Lattice portals with curved heels and How Lattice struts. The bridge served Main street, going alongside the railroad tracks until it was bypassed in 1976 and left in place. The city council and the state has been in talks about the future of the bridge because of its current state. The bottom decking is failing and there is a lot of rust, yet the truss bridge superstructure appears to be in great shape. Still, the city has elected not to spend the necessary $35 million for restoring the bridge and instead will spend half of the sum for a complete bridge replacement. According to the proposal, the truss bridges will be gone in favor of a mail-order truss bridge, whose design is yet to be determined. The historic bridge is for sale at a price of a dollar but only for a limited time. Even if dismantled and stored before being restored and relocated, there is a better chance to save at least a portion of the bridge’s history than to have it scrapped, a traditional technique, which is being used like the Bible in New Hampshire, for over 70% of the pre-1930s truss bridges have been demolished and replaced in the past 10 years- an alarming and sobering statistic! And for the bridges that are products of Mr. Storrs, should the demolition machine process continue, his works will be a memory before anyone has a chance to know about him. Should that happen, then we know how our own American history will look like- instead of knowing about how America developed in terms of its infrastructure and social themes, we will eventually know about Ronald McDonald and Coca-Cola- a concept even the writer of the book Jennifer Government had envisioned when the dystopian novel was released 13 years ago, but is slowly becoming realized day by day. Thanks to Royce and Bobette Haley for allowing the author to use some pics for this article. Unknown if and how the ferry can be repaired- damage substantial. UNESCO application threatened. A few years ago, I pulled an April Fools joke on the members of the historic bridge community by writing about the Rendsburg High Bridge coming down because it was unsafe for all traffic and the need of the German Railways to build a new, modern and larger crossing. The Rendsburg High Bridge is still coming down- just the transport ferry portion though. After sustaining substantial damage to the ferry because of a collision with a ship this past Friday, the Office of Waterways and Shipping (German: Wasser- & Schiffahrtsamt- WSA) on Monday decided to dismantle the entire ferry at the earliest possible convenience. Reason for that is because of the danger that the ferry could fall into the Baltic-North Sea Canal, hindering shipping traffic again. It is unclear whether the ferry will be rebuilt in a similar manner as the 103-year old structure before the ship smashed into it, turning it into a pendulum and injuring two people. According to information from German public radio station NDR, the entire steel structure of the ferry was bent inwards from the impact, whereas the operating house sustained large amounts of damage, and two of the twelve cables snapped. Repairs or even replacement could take a full year, which in the meantime, pedestrians and cyclists have to take a detour to a tunnel under the canal, which is 1.5 km east of the bridge. Drivers have to take a ferry, which is 2 km away or even the tunnel, which is heavily travelled. The danger of this action is that the planned induction into the UNESCO World Heritage list will be threatened if no ferry is put back into place or altered to a point of no recognition. It was originally to be listed as an international site in 2017, but as of present, the future of the transport ferry is unknown. The Rendsburg High Bridge is one of eight transporter bridges left in operation and is the only bridge in the world that features a transporter main span and a loop approach span. But one thing is certain, the mayor of Rendburg and the villages south of the canal have agreed that a crossing at the bridge is a necessity and not having the ferry in place for good will be a massive inconvenience to the area, and this goes beyond that UNESCO World Heritage factor. The Chronicles and sister column The Flensburg Files will keep you updated on the latest. OZARK/ SPRINGFIELD, MISSOURI- At about this time four years ago, attempts were made to raise funds, sign petitions and collaborate with government authorites to save and repair the Riverside Bridge in Ozark, a 1909 Canton Bridge Company product that has been spanning the Finley River for 106 years, serving as a key crossing to the northwestern part of the city. All these efforts bore fruit as the local road authority allowed for repairs to be made and the bridge to be reopened, all in 2013. These successful attempts garnered state, national and international recognition. Judging by the photos and videos, the damage to the bridge was mainly due to debris slamming into and getting entangled into the bridge. The rest of the structure appears to be in shape. Yet officials would like to see the bridge replaced and the truss bridge relocated. This is in part due to property rights issues around the structure. But suppose instead of replacing the bridge, one can supplant the truss bridge into a concrete bridge, where the trusses lose their function but serve as a decoration, but the concrete bridge would act as the crossing? With several examples existing in places like Indiana and Minnesota, it is an option worth considering. While a new bridge will cost up to $3 million, the cost for such a project will be just as much. Yet one thing is clear, no matter what happens to the bridge, rehabilitating it, replacing it and relocating it, or even placing it onto a concrete bridge, action will be needed to ensure that the next flood will not take out the crossing altogether. That means, a little bit more money will be needed to save the Riverside Bridge. The Bridgehunter’s Chronicles will keep you informed on the latest developments regarding the Riverside Bridge. Click onto the highlighted links to take you to the bridge, its history and the attempts to save it the first time around.